Maurice Lacroix - Connard & Son Ltd.
Ladies Rose gold plated (PVD)and diamond Maurice Lacroix Eliros quartz watch with date window at 3 and a centre second indication. Chocolate coloured dial with Roman numerals at the quarters and fine batons in between, polished rose gilt hands. On a new nine row link flexible bracelet with quick release clasp. The detachable bracelet can be removed easily and exchanged for a leather strap at home by yourself allowing for greater flexibility of the watch. Ladies stainless steel Maurice Lacroix Aikon quartz watch, the feature with this watch is the brushed case with the applied bezel with the contrasting polished outer twin markers every 10 minutes. Centre second hand and date window positioned at 6. 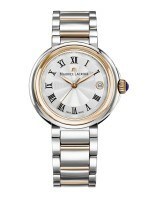 Mother of Pearl dial with Diamond set dots @ 1,2,4,5,7,8,10 and 11 and Roman numerals @ the quarters. Polished steel hands with reflective markers. On a brushed Stainless steel five row link bracelet with polished rounded off links and quick release clasp. A quartz range with screwed down buttons and water resistant to 100m. 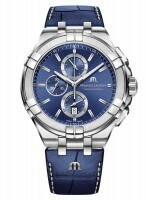 Gents stainless steel Maurice Lacroix Aikon quartz watch, with 10 hour chronograph timer, the feature with this watch is the brushed case with the applied bezel with the contrasting polished outer twin markers every 10 minutes. Sub seconds dial at 6, 10 hour timer at 12, 30 minute timer at 9 and date window positioned at 6. Blue dial with polished steel hands with large reflective markers and baton markers. On a blue leather alligator imitation strap, with polished steel centre lugs on a brushed Stainless steel deployment buckle. Gents stainless steel Maurice Lacroix Aikon quartz watch, the feature with this watch is the brushed case with the applied bezel with the contrasting polished outer twin markers every 10 minutes. Centre second hand and date window positioned at 3. Blue dial with centralised horizontal lines, polished steel hands with large reflective markers, quarter Roman numerals interspaced with fine batons. On a blue leather alligator imitation strap, with polished steel centre lugs on a brushed Stainless steel deployment buckle. Gents stainless steel Maurice Lacroix Aikon quartz watch, the feature with this watch is the brushed case with the applied bezel with the contrasting polished outer twin markers every 10 minutes. Centre second hand and date window positioned at 3. Blue dial with horizontal lines polished steel hands with large reflective markers, broad quarter batons interspaced with fine batons. On a brushed Stainless steel five row link bracelet with quick release clasp.